We've been in business since 1986 meeting not only the needs of the charter fisherman but the tourist & local fisherman as well. We invite you to come in and enjoy a bottle beer or glass of wine at the Live Bait Lounge. The bar has recently been replaced and J T did an excellent job of custom crafting the new bar. We have increased the variety of frozen bait in stock and will do what they can to maintain a full selection of live bait. Currently you can find pinfish, crab and shrimp in the live bait wells. The store hours are from 7am to 7pm, 7 days a week. Check back for updates and new products that will be arriving at the store. Come into our store and browse a wide variety of rods and reels as well as tackle and lures. We can meet all your bait needs at Key West Bait & Tackle. In addition to live bait, we have frozen: Shrimp, Squid, Pilchard, Mullet, Chum, Moharra, Ballyhoo, Thread Herring, Flying Fish, Silversides, Spanish Sardines and pre-rigged baits. Enjoy ice cold beer and wine while shopping. We can set up fishing charters for you and your family and friends. The staff at Key West Bait & Tackle can also arrange a trip with many of the fine fishing guides in town. There are many options including shallow water flats fishing, reef fishing, wreck fishing and offshore deep sea fishing. 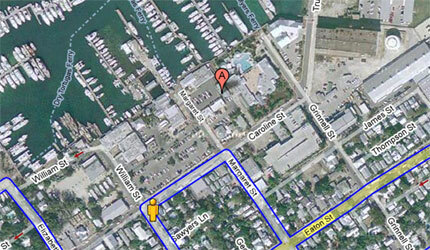 Key West Bait & Tackle has everything you might need to fish a tournament in Key West. All the best lures, spreader bars, sabiki rigs, hooks, knives, pliers and Shimano rods & reels are available. We do carry live bait and frozen ballyhoo too.